Easily restore deleted or lost data from iTunes backup file generated by the latestiPhone, iPad or iPod. Comfortably Browse and preview items stored in iTunes Backup before restoring them to your iOS device. This is by far the most flexible option to retrieve files from iTunes Backup. In default, you can only restore the device as a whole, meaning unnecessary and junk files will also be restored to iPhone/iPad/iPod. 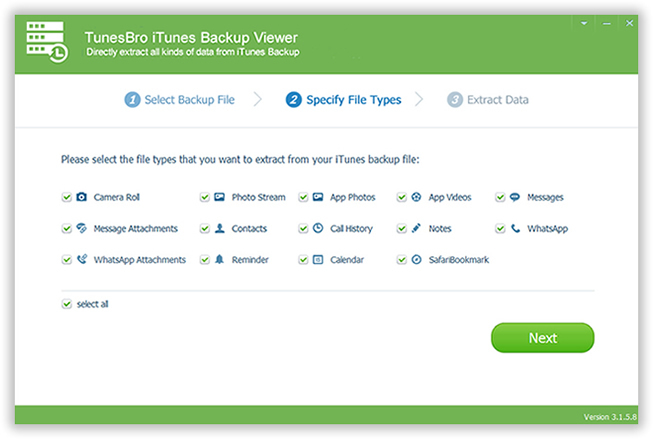 With TunesBro iTunes Backup Viewer, only selected items will be recovered. Most importantly, you can preview them first before recovery. Software is made for the usage of human beings. So the simple, the better. That concept was bearded in our mind since the beginning of our project. With carefully crafted UI, No matter you are a completely computer novice or a tech guru, you can use the program freely by following the prompt. Data on iDevice could be deleted with a single tap or due to system crash. And this happens a million times among iOS users. That is why we should backup our device with iTunes so we can restore the file later to prevent data loss. 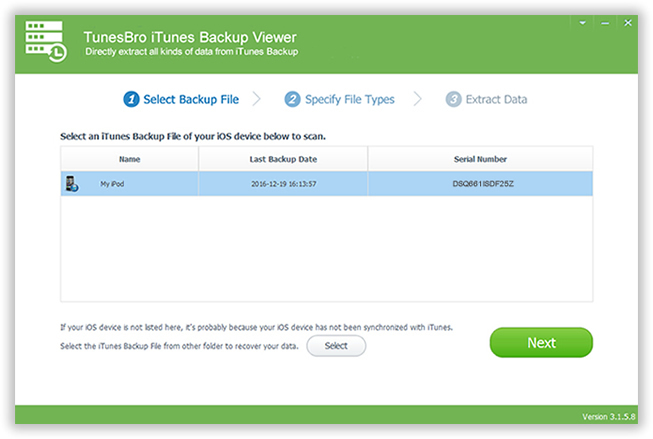 Below is a few cases that we can use TunesBro iTunes Backup Viewer to recover the deleted or lost data on iPhone, iPad or iPod. Retrieve lost data due to accidental deletion, the most common case in our daily life. All data will be erased after system crashes. No worries! It can be restored completely. Device was reset due to wrong operation? It is not a big deal at all with the help of this software. iTunes	wipe	all	data on your device after restore? You can fully recover them via this app. Still not convinced to try this product? Well, there are other amazing features you will not get from other similar products! iTunes backup file is hidden by default on all Windows machines. TunesBro iTunes Backup Viewer is able to detect all backup files on the computer automatically. What happens if the backup file was encrypted? This is no longer a problem if using this app. It can restore files from encrypted iTunes backup file. Passed a series of strict tests conducted by independent secure agencies. The program is totally virus free and no ads/malware being detected after installation. 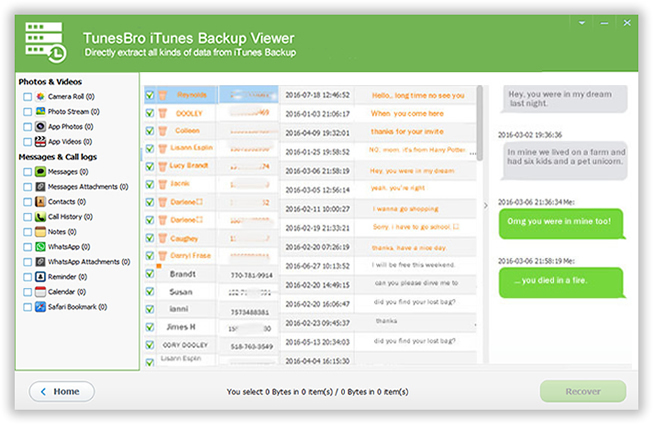 You could find tons of competitive products via a single search, but TunesBro iTunes Backup Viewer will be your own choice once you give it a try. Action and user reviews proves everything. "I am able to retrieve all the deleted photos from my previous backup. What surprizes me is that TunesBro iTunes Backup Viewer even support iTunes backup with a user password. I tested 3 other programs and none of them had such a feature. That is why I finally go with TunesBro software. "